Submitted by galenbrill on September 1, 2015 – 11:55am. 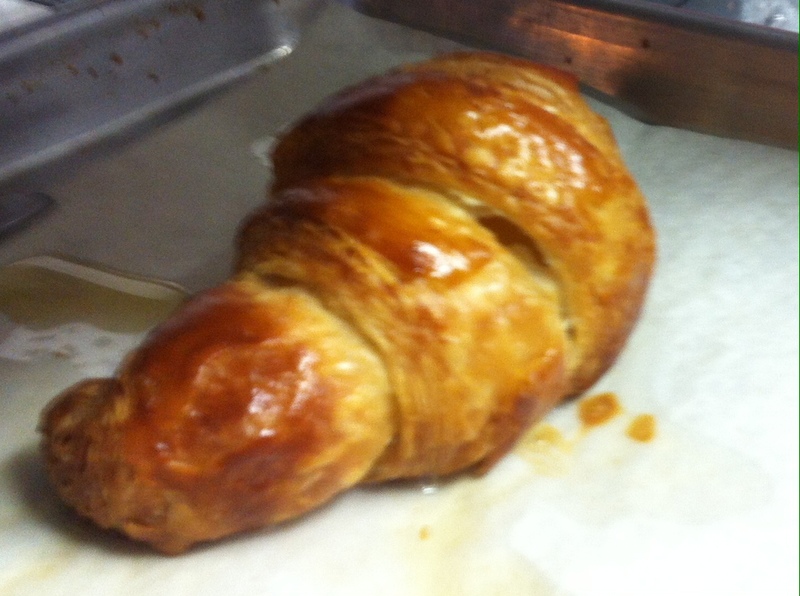 I’ve recently been making croissants, with a good amount of success, after lots of practice. However, I am beginning to encounter a problem that I hadn’t previously had, and haven’t had much luck in pinpointing the cause. The center of my croissants have been deflating, or collapsing, after they come out of the oven (they look fine while baking). Here is an example (sorry for the poor quality). I have tried extending my baking time (usually about 25 mins at ~325 degrees fahrenheit). I always proof them for between 2 and 2.5 hours, and I do not move the tray while they bake, as I hear this can cause the center to collapse as well. The temperature while proofing is usually between 75 and 80 degrees, and humidity is most likely lower than it should be, so I’m having trouble believing that over proofing is the problem. I have tried rolling the dough out a bit thinner, or elongating and rolling the triangles out thinner before shaping, which hasn’t seemed to help much. Maybe I should use a little less yeast? They seem to be rising sufficiently otherwise. Maybe insufficient humidity during proofing is drying out the outside while keeping the inside too moist (I don’t have a proofer, so humidity is tough to control, I am applying at egg wash before proofing and again before baking)? I was thinking it could be simple under-baking, but when I’ve baked at higher temperatures, the croissant ends up with an undesirably thick crust. Any advice you may have to offer would be tremendously helpful.